Last night's baked potato leftovers can become today's breakfast, lunch or late-night snack. It's easy to transform a baked potato into something new, but it's also easy to overlook food safety. Only save potatoes that were baked plain, not wrapped in foil, and that reached a minimum temperature of 185 degrees Fahrenheit when first cooked. Use leftover, refrigerated potatoes within four days. You can reheat potatoes in the oven or microwave, as long as they're heated to a minimum internal temperature of 165 degrees. 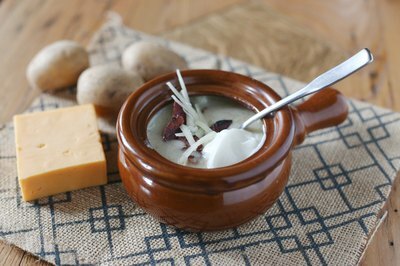 If you have pre-baked potatoes, it only takes about 15 minutes to make baked potato soup. Make a soup base of butter or bacon fat cooked with flour and thickened with milk. Scoop out the flesh from the leftover potatoes and mash it gently. Add the potato to the soup, along with salt and pepper to taste, and cook for another minute. Finish the soup with shredded cheese, crumbled bacon, chives and sour cream. You can also add more flavor by sauteing garlic, onion and carrot in the butter or bacon fat before adding any other ingredients. Use cubed chunks of baked potato in your favorite potato salad recipe. 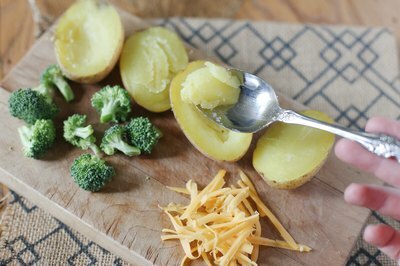 Leave the peels on or gently remove them before chopping the potatoes into bite-sized pieces. It's fine if they partially crumble. Mix together sour cream and mayonnaise, and add potato salad staples such as green onions, celery, chopped hard-boiled eggs and bacon. Gently fold in the potato pieces, and add salt and pepper to taste. You can make a lighter salad by combining the potato pieces with vinaigrette, lemon juice and fresh herbs. With one baked potato, you can create two new meals. Slice the potatoes in half lengthwise. Scoop out the flesh, leaving enough inside the peels to give them some structure, and mash it up. Stir in milk, butter and cheese, or load the potato mixture with roasted vegetables and spinach. Make a Mexican-inspired dish by adding black beans, corn, cumin and tomato. If you're making breakfast, combine the potato with cooked bacon and sausage. Spoon the potato mixture back into the potato peels and bake them in a 350-degree Fahrenheit oven for about 20 minutes. Top the finished breakfast spuds with fried eggs. Make bite-sized appetizers or a hearty entree out of potato skins. Slice the potatoes in half and then into chunks or wedges. Cut away some of the potato flesh and brush the skin of each piece with melted butter or oil. Arrange the skins on a baking sheet and add toppings. Try pizza-flavored skins topped with tomato sauce and shredded mozzarella, or make a healthier snack with steamed broccoli and cheddar. Bake the skins at 450 degrees for about 10 minutes, or until they're crisp. Serve home fries with scrambled eggs for breakfast, or alongside ham or beef at dinner. Cut the potatoes into cubes or into 1/4-inch thick slices. Dice up a small onion as well. Fry the potatoes and onion over medium heat in a saute pan with equal parts butter and olive oil. Let the mixture cook for about 10 minutes, and then use a spatula to carefully flip everything over. 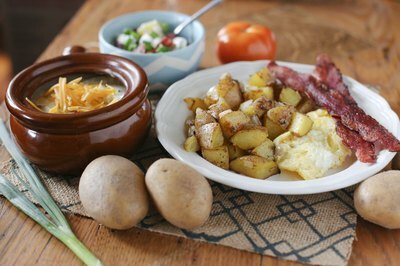 Continue cooking until the onions are translucent and the potatoes are brown and crispy. Idaho Potato Commission: Can I Eat Week Old Potatoes That Have Been Cooked and Refrigerated?